Yesterday in the comments Martha asked, “Wait, Sunday was even more exciting? How could that be?” I’ll tell you how it could be more exciting – Sunday was the Sheep to Shawl competition and my good friends were competing. Here we see Betsy, Vicki, Terry, Cheryl and Kelly each doing their part for the competition. 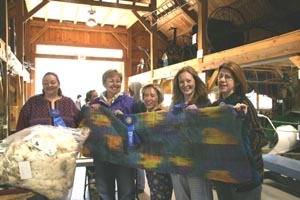 Each team had 3 hours to start with a fleece and end with a shawl. They were required to have a theme and The Gogh Gogh’s theme was “Starry Night” or something like that. 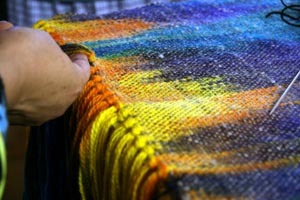 They took their inspiration for the shawl from Van Gogh’s painting and they ran with it. They painted a gorgeous warp in advance of the competition. 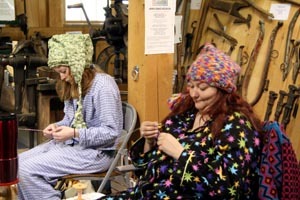 They knitted sleeping caps and made pajamas to wear as costumes. And made a really gorgeous shawl to boot. It doesn’t get any more exciting than that, Martha. It was lots of fun to watch and I’m so proud of my friends. Next year, though, they’d better watch out. I think there will be a new team in town. Hee hee! What fun! It’s amazing that all that could be done in a day. Wish I had been there for the second day! Great photos and kudos to our friends for their blue ribbon! Stunning shawl! Sound like they met all their goals, including getting more people to participate. How fun to see them hard at work and having fun, too! Wow. The shawl is gorgeous, and I love the team name and how caught up in the spirit everyone was. How fun! Ohhh, I wish I’d stayed an extra day to be able to see this. They did such a wonderful project! I love it. I wish I could have gotten back to watch the grrls compete. How fun! That’s really cool! I like how they dressed the part. And the shawl is very pretty. Well, to be fair, I actually didn’t make my own pajamas. I just pulled them out of a drawer and wore them. But I did knit the sleeping cap! They ROCKED those sleeping caps, didn’t they? It really is a beautiful shawl … who got ultimate custody of the finished product, I wonder? How cool! 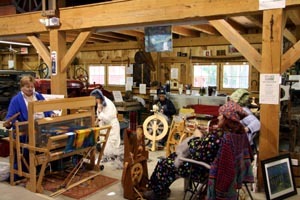 They’re very talented and the shawl is beautiful. WOW…the colors are amazing! Congratulations to the winners!! I’m so bummed to have missed Sunday.. I would be very cool to get some other teams going for next year. It WAS amazing, wasn’t it? The finished shawl was beautiful. That doesn’t always happen in S2S with so little time. The kids were great. I wanted them to have a ribbon just for being there and knitting their entry. Maybe their should be a separate class for a younger age group. How awesome! Sounds like a great time. That does it! I MUST get to Hopkinton next year!!! That shawl is very cool. I love the theme they chose. What a B-E-A-utiful project. Great pics too! 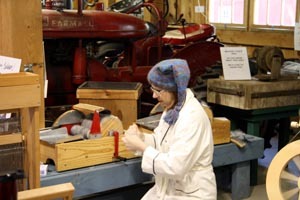 Well crud, now I want to learn to spin and weave…hehe…..twist my arm! THREE HOURS! Holy sh… Wow. What fun! Love the sleeping caps! what an amazing accomplishment. Congrats to all of them – woo hoo, blue ribbon! And it’s beautiful too. this contest always astounds me, it shows what creative minds can do. thanks for the great photos Carole. Are you really going to do it next year?? How nice to see pictures of the action! 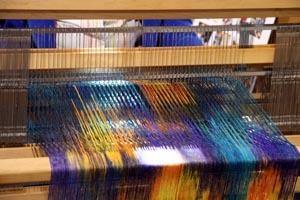 I didn’t get down to the museum until the shawl was off the loom and the fringe was being knotted. Great to see the whole piece finished! Great job, ladies! I really cannot believe they made that in three hours. Can you make a Shapely Shawlette, does that count? How will I know who to cheer for next year?? That shawl is amazing. They’re all rock stars as far as I’m concerned. TOTALLY impressed. Wow, that’s beautiful. I’d love to do a Sheep to Shawl someday. WoW! That is so fun and fabulous. Glad you captured the day, since I was in Vermont. Great pics!